Craving something with a zap of sweet cherry and a zing of savory? 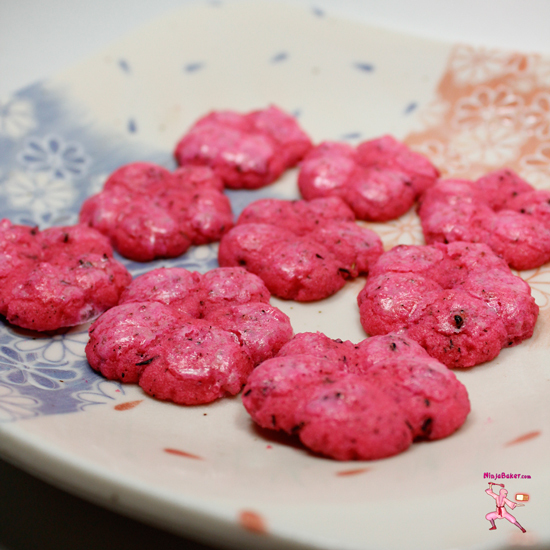 The Ninja Baker’s cherry blossom cookies are a pretty-in-pink pick-me-up from a 4 o’clock slump! The cherry blossom shapes were created via my cookie press purchased at Williams-Sonoma. Softer dough seems to work best in the cookie press. However, the cherry blossom cookies will spread so do place them in the freezer overnight. Adapted from a lemon citrus tea cookie recipe introduced by Carla Hall on ABC TV’s The Chew. Whisk together the flour, cherry blossom tea grounds in a bowl. Set aside. With the paddle attachment of a kitchen stand mixer, beat the butter and sugar until light and fluffy. (About 5 minutes.) Add the cherry and vanilla extracts. Squeeze in a few drops of pink food coloring. Slowly beat in the flour, cherry blossom tea and salt mixture. Combine well. Divide the dough into two disks. Cover in plastic wrap. Refrigerate overnight. While the dough is softening, whisk the powdered sugar, Kirschwasser and drops of pink food coloring together. Fill a cookie press or roll out the dough to make cut out cookies. Paint the cookies with Kirschwasser glaze. Place on parchment lined cookie sheets and freeze overnight. Bake in a 325-degree oven for 16 minutes, rotating the cookie sheet half way through baking.